Buona sera. I still plan on making a Weblog just for Christian material, for and about Christian concerns, but I can't wait. Yours truly managed to get himself into trouble on "Black Friday". A bit, anyway. I had decided that I had better take firm steps to practice what I preach. One thing that I preach is that Christians are woefully lacking in their primary purpose, that of sharing the gospel. I have been in Ray Comfort's "School of Biblical Evangelism" for a while, and it has taught me a great deal. In addition, I have learned from his audio and video. I recommend that any real Christian check those out, as well thisthis, and then examine their own convictions about the final destiny of the lost, capice? So, about practicing what I preach. The Bible teaches that those who die without Christ are on their way to Hell. No Purgatory, no reincarnation, no second chance after death; eternity is settled. Jesus commanded Christians to spread the gospel to everyone. What can lil' ol' me do? I am not exactly cut out for open air preaching. Yet. We'll see where God leads. In the meantime, I can still pass out gospel tracts. 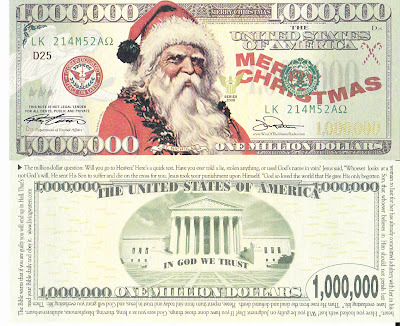 My current favorite is the million dollar bill. 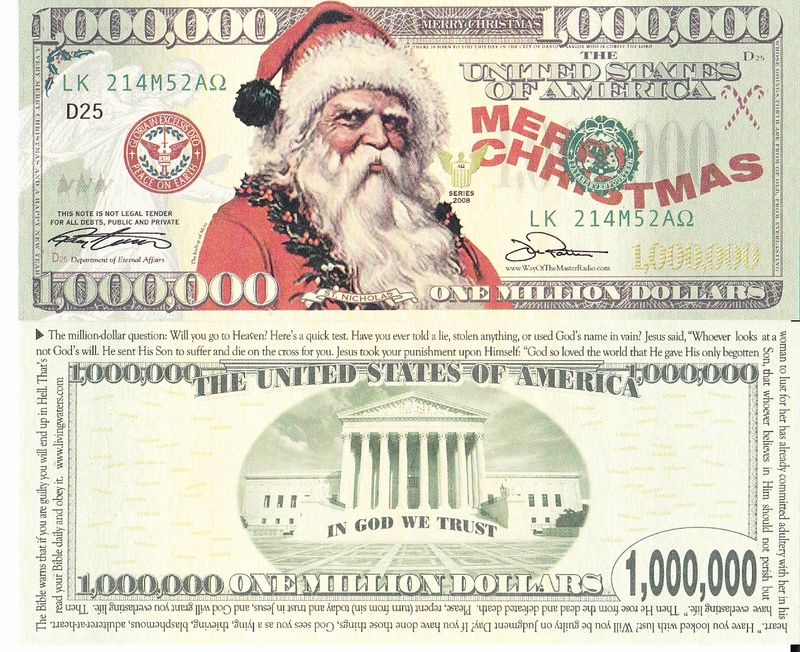 This time, I selected the "Santa Million". After all, it's a great day to have many people out and about doing their Christmas shopping! Satan does not want the truth to get out and for people to be removed from his control. I had all sorts of fearful thoughts and anxiety (as well as lazy thoughts), but I put my faith in God where it belongs and pressed on. Once I got started, things were going well. I met some Christians (and gave them the name of a song that they had been wondering about) as well as people who were rather rude in their refusal of the tracts. Most were pleased to have such a fun gift. "Sir, we can't have you doing that in the mall". Two men were standing there, but only one spoke. He continued to inform me that I can put them away and shop, or I can leave. But if I persisted, "We will get the police involved". I was not argumentative in the least. After all, despite popular misconceptions, the mall is not "public property" and they were within their rights to shut me down. Jethro Gibbs Wannabe was irritated when I offered a tract to his partner and him, and said, "If you offer again, we'll put you off the property". I told them that I understood, and that I would leave. Before I left, I told him that he said it very well. Just between you and me, I get irritated at rent-a-cops at malls that get attitudes. Jethro Gibbs Wannabe was polite enough, but I could tell he detested my very existence. (Sure, I know that's subjective, but you know that feeling, yes?) He was also smart enough (or trained enough) to know that he could not lay a hand on me, because that would be assault, and rent-a-cops do not have that authority. Also, he over-stated a bit by threatening the police. The only reason I'm saying that he over-stated is that I was being polite and co-operative. But this was not a matter of my Constitutional rights being violated, and I knew it. I was there to proclaim the gospel and please the Lord, but my timer ran out. At any rate, I hope and pray that my politeness (despite being a bit annoyed at his demeanor, which I hid very well) and my co-operation will be a witness for the gospel. Yes, I do know what that word means. But anyway, I've been mulling over some comments by hardhearted people. One was at Atheist Central. I had made a comment about Christians being persecuted, tortured and murdered by the millions, and that it is still going on today. A loser said (paraphrasing), "Good, they deserve it because of all the wars they caused." Aside from being utterly and totally ridiculous (yes, and stupid, we did establish earlier that some people are, indeed, stupid), it was amazingly heartless. I should not be surprised at this atheist "morality", but still, the suffering and murder of innocent people should not be applauded. Another thing that grinds my gears is the way people excuse, ignore and basically brush off the persecution of Christians: Other people are persecuted too, it's not happening here &c. Oh, please! My purpose in my articles (here and here) was to raise awareness, especially for other Christians, of what is happening in the rest of the world even today. Sure, other people get persecuted by communists (including their own people); communism is evil and should be eradicated somehow. Besides communists, the other main group that is responsible for this reprehensible activity is the Muslims. Edit: This just in: Harassment of Christian teachers in Dearborn(istan), Michigan. The fact is, if someone has a semblance of a heart, they will care about the persecution of Christians in the world. There is only one other group that has a longer history and knowledge of persecution, and that is the Jews. I'm not all that thrilled with the above quote, but it does help to illustrate a point. When revolutions occurred, the "intellectuals" were imprisoned or executed (look it up yourself, I can't do all of your work for you). Many atheists utterly hate God and Christians, and want us eliminated. Guess what? Muslim extremists hate you as well as me, or anyone else who does not fit their brand of dedication to Islam. Shall I keep going, or are you with me? Good. Just remember that Christians are standing up for human rights. Some people say they do not believe in God, they believe in mankind. Well, "mankind" is killing other people for selfish ends. If you were truly a humanist of any kind, or a humanitarian, you would have some compassion for the Christians that are being persecuted and murdered, and not just wave it off. That is simply heartless and selfish, as well as intellectually stunted. And probably religious bigotry mixed in as well. If any of you who agree with what I said want to link to this the next time you get a "so what" comment, feel free. Show these "humanists" that they are being inconsistent, and we should all pull together. No, Nicky. I'm saying that you should go to The Organ Stop for pizza the next time you're in Mesa. The Wurlitzer organ is a classic — oh, company's here. Buon giorno. Stupid people get on my nerves. You too, huh? That's not surprising. But — what exactly are "stupid" people? We all know some people who do inexplicable things that a reasonable person would not say or do. "What did you do that for? That was stupid!" Some people seem to lack simple common sense. But quite often, it's not that cut and dried. Sometimes, there are reasons for what we consider "stupid" things. Uninformed. If someone did not know better, it is unfair to find fault with him. "I've never seen one of those before, and didn't know that it would do that. Sorry." Differences of opinion. You believe this is true, I believe that is true. Disagreement itself does not equal stupidity. Fatigue, stress, medications acting up, distractions. Don't give me that smug look, you know it's happened to you, too. One of my best examples was on September 11, 2001. I was driving and missed my turn. So I went back, tried again, missed it again. Terrorist attacks two hours south of me are quite a distraction. Another thing that comes to mind is my own writing. I have re-read and almost cringed at bad wordings because I wrote at less than optimal times, giving the readers less that they deserve. So, I try to fix some of those. Different understandings. Whether it is culture, upbringing, social conditioning, simple ignorance or whatever, it is often best to define our terms. Just not thinking. Pay attention, Percival. Focus, Frankie. Laziness. Let's face it, some people do not want to be bothered to actually think, but want others to do the work for them. We all have those times, but it should not be a lifestyle. Prejudice and bias. The assumption that people of (insert persuasion here) are stupid in the first place. How can someone of (that persuasion) explain to you about Concepts B through Z, when you say flat out that his Concept A, the foundation of it all, is a lie? Not only is his listener unable to understand the rest of the points, he thinks that the speaker is stupid. The listener probably seems stupid to the speaker as well because of his refusal to try to understand. Anger and hate. No, I am not going to repeat that article. But I have seen many times when people are so obsessed with hate, or become so angry, they "stupidify" themselves. Sometimes, I believe people are being deliberately stupid because they refuse to understand the point that the other person is making, believe that the other person is incapable of making a valid point, or they have their own bias and just don't like what the other person is saying. Similarly, declaring something to be true or untrue does not make it so, no matter how much you may disapprove. Something that is both sad and frustrating is when hateful, biased people agree that they are intelligent and their opponents are the stupid ones. Deceived. Sometimes, it's rooted in hate and people are jumping on a bandwagon. There are some very intelligent people I know that are deceived into hating. They are not stupid, but they are not thinking for themselves. It's easy to be judgmental because someone does not know what you're talking about. What is it that we do to sabotage our own efforts at being understood, receiving blank stares, wrong replies or just, "Huh?" I want to add that I do not quite go along with the old adage, "There is no such thing as a stupid question." Yes, I believe that there are stupid questions — under certain conditions. If someone is simply not bothering to think, not paying attention, has already given the answer several times &c. It seems that the most productive thing to do is to make the best of that situation, and perhaps avoid wasting time with that person, or getting into that situation with that person, in the future. Capice? Using "lingo" that is peculiar to our knowledge, experience and occupation. "Jesus is the propitiation for our sins." "The sling lift is malfunctioning." "The trajectory compensated for the apogee of Mars." Sure, this makes sense to your associates, but other people get lost in your terminology. Incompleteness. We expect people to understand us, but we did not lay a foundation for their understanding. It's like opening a book in the middle and trying to understand the story. Great expectations. The dickens of this is that we can assume and expect people to know what we are saying without doing a "check point" to make sure that everyone is on the same wavelength. Bonus: You can demonstrate this yourself by saying or writing something back: "If I understand you correctly, your belief is..." when you're trying to understand someone. Joe Thesaurus. Some people like to put on airs by filling up their sentences with expensive words instead of communicating plainly. Consider your audience. This ties into several points above, I know. When I was in a class on speechifying, I was told to talk as if I had an audience of twelve-year-olds. This helps in many ways. There were times I had to talk to uneducated people in one part of my job, and then report to the business-oriented supervisors on the other end. Speaking plainly helped in both areas. Caution: Do not "dumb down" your words, or act like you are above people and doing them a favor. Instead of communicating, you'll be insulting. "Do you understand this, or shall I say it again slower and use one syllable words?" That example is blatant, but sometimes, we can appear that way to our hearers or readers. Creating an emotional situation. Just try to talk reasonably with an angry crowd. Worse, get people worked up seven ways 'till sundown and then try to make sense to them. There's a difference between stirring up emotions and giving a motivational talk. Bad timing. Sometimes, you should just clam up and wait because now is not a good time. Limited understanding. You try to explain something, but someone does not have the background (and possibly the intellect) to grasp what you are doing. Are they "stupid"? Possibly, but more likely, you are being unfair by expecting too much. Then, you are on the receiving end. Even though you have the superior knowledge, you are considered stupid or even a liar because they cannot (or will not) grasp your point. For instance, God says, "My thoughts are not your thoughts, neither are your ways my ways" (Isaiah 55.8-9). Also, spiritual things are not understood by unbelievers (I Cor. 2.14). So, explaining a deep biblical concept to an unbeliever is usually frustrating because he cannot receive it. Therefore, you are the stupid one for believing in something he cannot understand. Agonizing. It's a good thing that we have Jesus to explain God to us (John 1.18). In summary, we all have stupid moments. And yes, some people really are stupid. But more often than not, they could be having a "moment", and if you knew what was going on, their "stupidity" would actually be understandable. If someone called you stupid, you would probably bristle and respond, yes? Then try this: Cut them some slack, and think about some of the ways you may have fouled up, even though you fully believe that you are not really stupid. Matthew 7.12.